ຕັນກ່າວວ່າ "ຂ້າພະເຈົ້າ ຄິດວ່າ ມັນບໍ່ເປັນທໍາປານໃດ ທີ່ຈະເວົ້າວ່າ ທ່ານທຣໍາ ໃຊ້ໄຕ້ຫວັນເປັນຕົວປະກັນໃນການຕໍ່ລອງ." Taiwan and the United States are showing signs of growing a solid relationship that goes beyond U.S. President Donald Trump's widely suspected use of Taipei as a bargaining chip in his administration's talks with China, analysts say. The analysts say Trump is looking to Taiwan as part of a broader Pacific Rim political alliance, while officials and members of the U.S. Congress see Taiwan as an antidote to an ever-mightier China. "I don't think it is completely fair to say that Trump is using Taiwan as a pawn," said Yun Sun, East Asia Program senior associate at the Stimson Center think tank in Washington. "The support and sympathy for Taiwan is very strong here in the U.S.," she said. "This is partly due to the politics, but also is the result of China's bullying behaviors. It does help to broaden and strengthen the support base for Taiwan in the U.S."
Two arms-related deals, a congressional bill that calls for more senior-level Taipei-Washington visits and a string of comments from the United States in support of Taiwan's foreign diplomacy this year have raised fears that Trump is using ties with Taipei just to get concessions out of China. 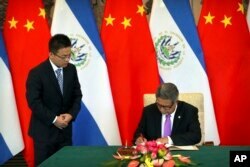 Two days after Taiwan cut ties Aug. 21 with El Salvador, the U.S. State Department expressed "grave concern" and warned the Central American country against taking economic incentives from China. Taiwan looks to U.S. ties to offset losses of small allies such as El Salvador. In another sign of closer Taipei-Washington relations, Taiwan President Tsai Ing-wen made two unusually visible stops in the United States earlier this month over protests from Beijing. She gave a speech August 13 in Los Angeles. In Houston she became the first Taiwan president since the 1970s to visit federal property. China sees self-ruled Taiwan as part of its territory, not as a country, and resents major powers such as the United States for interacting with it. China and Taiwan have been separately ruled since the Chinese civil war of the 1940s. Since Tsai took office in 2016, Beijing has flown military aircraft near Taiwan at least a dozen times and, officials in Taipei say, persuaded five countries to drop Taiwan as an ally. Tsai rejects Beijing's condition for dialogue, that both sides talk as parts of the same country. U.S. officials favor Taiwan now to ensure the Asian island's own relations with China don't change, said Bonnie Glaser, director of the China Power Project at the American think tank Center for International and Strategic Studies. Washington has long advocated stability between China and Taiwan rather than one side provoking the other. "U.S. policy makers aren't seeking ways to use Taiwan to increase leverage over China," Glaser said. "In response to stepped up military, political and economic pressure by Beijing on Taiwan, the Trump administration is signaling support for the maintenance of the cross-Strait status quo and for Taiwan's security." Trump may see Taiwan as part of an Asia Pacific alliance that would resist China, said Lin Chong-pin, a retired strategic studies professor in Taiwan. "He's also trying to unite the allies in the East Asian Pacific region to form a united front against China and to add pressure on China," Lin said. "Not only Japan, Australia and India, but Taiwan is also one them along with South Korea in forming a united front against China. That's the intention." Washington stepped up military cooperation last year with Australia, India and Japan to keep the South China Sea open to international traffic. Beijing claims about 90 percent of that waterway. Trump may see Taiwan as a "card" to play against China in getting what he wants from Sino-U.S. relations, said Alex Chiang, an international relations professor at National Chengchi University in Taipei. If the ruling Republican Party loses seats in mid-term elections this year, he added, the president may change his China policy and relations with Taiwan might slip. "I think Trump is mainly thinking about the U.S. interests, and he is using Taiwan as a bargaining chip," Chiang said. "I don't know whether he will be able to continue to play (the) Taiwan card, because someday very soon there will not be any kind of benefit he can derive." But Taiwan foreign minister Joseph Wu is unworried that his island will become a "bargaining chip in U.S. talks with China," the ministry quoted him saying last week. Officials in Taipei should compile a "list" of what they want from the United States so they can achieve those goals, said Raymond Wu, managing director of Taipei-based political risk consultancy e-telligence. "If we have a very clear idea about what Taiwan's interest is, then I don't think Taiwan will become someone else's pawn," Raymond Wu said. "We need to have some type of internal consensus."